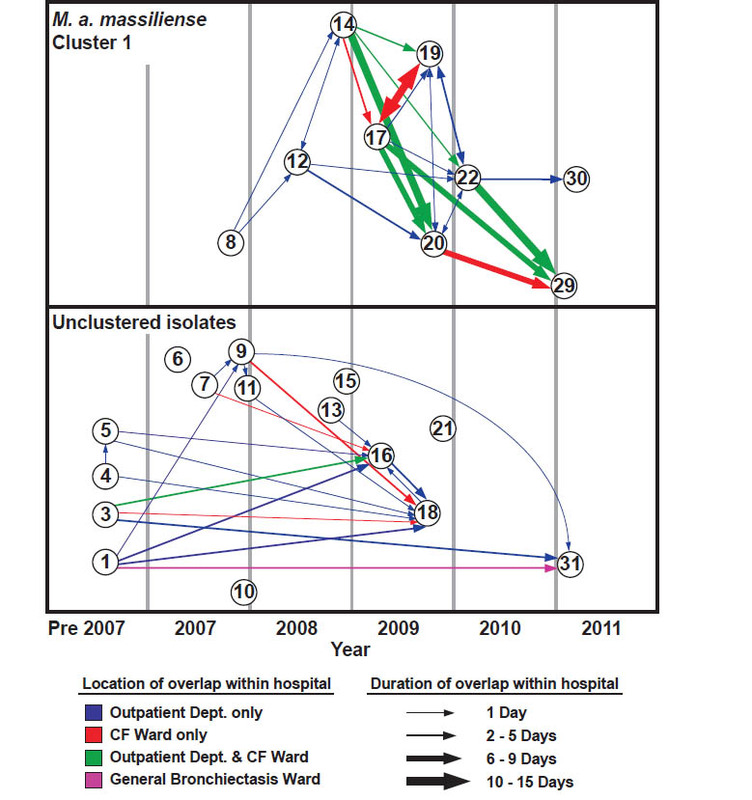 Network analysis of patients with clustered and non-clustered M. abscessus. Mycobacterium abscessus is a bacterium which has a naturally high level of drug resistance to many antibiotics. For this reason, clinicians are particularly concerned when cystic fibrosis patients become infected, as the infection is often chronic and extremely difficult to treat. What’s worse the incidence is thought to be rising; now infecting between 5 and 10% of CF patients. Like its relative, M tuberculosis, it causes lung infections, but it differs in how it spreads. Prior to our research, doctors thought that most cystic fibrosis patients acquire this infection from the environment and that transmission between patients was impossible or rare. Doctors at Papworth Adult Cystic Fibrosis Centre really wanted to nail down how CF patients were becoming infected. Our team had shown previously that whole genome sequencing is a powerful tool that can be used to track transmission of MRSA (Harris et al 2012), and I applied these same techniques to M. abscessus. We sequenced 168 strains from 31 patients collected over 4 years. Most strains isolated from different patients were distantly related, suggesting independent acquisition from the environment. However we also noticed a striking pattern where 11 of the patients’ samples fit into two phylogenetic clusters. Within these clusters different patients often shared identical strains. Researchers at Papworth then went trawling through the patient records, and found that these patients had often been at the centre on the same day. This suggested to us that this bacterium was spreading between the patients. This result was surprising, and unexpected, particularly because the infection control procedures applied at Papworth are so thorough, in accordance with current recommendations. Other bacterial infections can be spread between CF patients, and procedures are put in place to prevent this from happening. Patients are kept in separate rooms, and are strongly discouraged from socialising. Therefore we think that this bacterium is likely to be spreading indirectly, perhaps through particles in the air which may be produced during procedures that test lung function. The fact we have found a pulmonary infection to be transmissible isn’t surprising to many people. The lead researcher at Papworth, Andres Floto, was asked by a BBC Radio 4 presenter “…it would seem fairly obvious that it might be spread by person to person, why did it take so long to establish this particular transmission?” The possibility of transmission has been explored previously, however scientists found no conclusive evidence. There could be a number of explanations for this. Firstly, the mutation rate of this bacterium is extremely slow meaning previous studies using current techniques based on few genes have been limited. Secondly many of these studies were carried out at least a decade ago when M abscessus infections occurred at a lower rate; and transmission may not have been so frequent. Irrespective of whether this is a new process or not, our findings tell us that the clinical approach to M abscessus needs to change. Papworth have already made amendments to their infection control procedures. We are now planning to sequence more isolates from across the UK. This will enable us to work out how often transmission is occurring, and how we can prevent it. Josie Bryant is currently a PhD student in the Pathogen Genomics group led by Julian Parkhill at the Wellcome Trust Sanger Institute. Her work focuses on using whole genome sequencing to understand the evolution and transmission of pathogenic Mycobacteria. Josephine M. Bryant, Dorothy M. Grogono, Daniel Greaves, Juliet Foweraker, Iain Roddick, Thomas Inns, Mark Reacher, Charles S. Haworth, Martin D. Curran, Simon R. Harris, Sharon J. Peacock, Julian Parkhill and R. Andres Floto (the Lancet 2013) ‘Evidence for transmission of Mycobacterium abscessus between Cystic Fibrosis patients from whole-genome sequencing. ← Is arthritis due to DNA’s dark matter?